In recent years, many states and local jurisdictions have started implementing a variety of "alternative" or "innovative" intersection designs to help improve traffic flow and safety at a relatively low cost. That trend has made its way to San Antonio. One of the biggest problems in a conventional intersection is the handling of left turns. Left turns are the most inefficient movement at an intersection. This is especially true at signalized intersections because they require extra signal phases that add delay to the through movements. At intersections with heavy left turn volumes, that delay can be signficiant. This then causes cumulative delays resulting in poor intersection throughput and chronic congestion. To date, all of the above except the "Michigan Left" have been implemented in San Antonio or are planned and are described in more detail below. There are several more designs that aren't in use or planned for San Antonio including the Jughandle, Center Turn Overpass, Michigan Urban Diamond (similar to but different than the Michigan Left), Echelon, Raindrop, and Parallel Flow; you can read all about these at the "Alternative Intersections/Interchanges Informational Report" link at the bottom of this page. 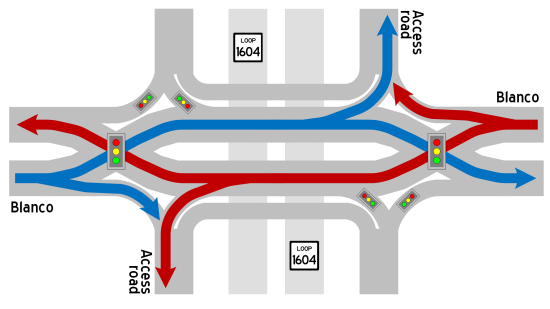 In San Antonio and most of the US, roundabouts have been typically limited to low-volume intersections (usually in lieu of four-way stops or short-cycle traffic signals) whereas the other designs are geared for high-volume intersections. SPUIs are typically only used at grade-separated (i.e. freeway) intersections while the others can be used at both freeway and arterial intersections, although Superstreets and Michigan Lefts are typically not used at freeway intersections. Each of the intersection designs above deals with left turns in different and unconventional ways in order to either eliminate the signal phases required for them or combine those phases with other phases. Doing so means fewer phases per cycle, which allows more green time for the through movements. This results in more throughput and therefore less congestion. So without further pontificating, here are some basic descriptions of the alternative intersection designs currently in use or planned for San Antonio, how they work and improve traffic, and where they are or will be used. A roundabout works by providing a continuous, one-way circular flow of traffic. Because traffic entering a roundabout is not required to stop if there is no conflicting traffic, it can move more traffic over the same period of time than a four-way stop or signal. 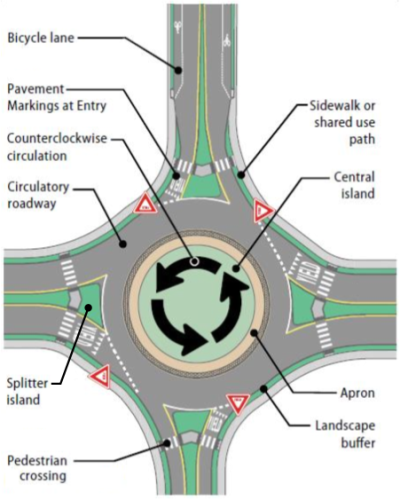 Furthermore, unlike a conventional intersection, the extra space in a roundabout and its flow allows a vehicle on all four approaches to enter and traverse the intersection simultaneously, again helping to move more traffic. Studies have consistently shown a reduction in delays ranging from 13% to 89% at intersections converted to roundabouts. Additionally, the curved roads in a roundabout eliminate the possibility for T-bone and head-on collisions and reduce the speed of traffic through the intersection, thus improving safety. Indeed, studies have shown a 37% reduction in overall collisions and an astonishing 90% reduction in fatal collisions at intersections converted to roundabouts. One of the first roundabout retrofits in San Antonio was at Blanco and Fulton where it replaced a traffic signal. It was met with much skepticism, criticism and predictions of mayhem and carnage because of the adjacent elementary school, none of which materialized. There are now far too many roundabouts in the San Antonio area to list them all. Dozens of neighborhoods and shopping centers have them. Notable locations include the McCullough/Olmos/Ed Prado intersection in Olmos Park, Ewing Halsell and Charles Katz in the Medical Center (which includes separate right-turn lanes on a couple of the approaches), the main entrance to UTSA, and a new one downtown at Romana Plaza. Double roundabouts (sometimes referred to as "dumbbells" or "dog bones") are now also being considered for a few access road intersections in fringe areas. A DLT increases the throughput of an intersection by allowing traffic headed in both directions on the major road (including left turns) to all move simultaneously (or nearly so.) This is accomplished by diverting ("displacing") the left-turning traffic to the opposite side of the roadway several hundred feet upstream from the near-side intersection. This displacement moves most or all of the left-turning traffic across and out of the way before opposing through traffic reaches the crossover location, thus minimizing or even eliminating the time through traffic has to wait for the opposing left turning traffic. The displacement also provides a short overlap period that permits left-turning traffic to be released even while the intersecting road still has a green light. This "continuous flow" of traffic in both directions means that only one green phase is needed for both directions on the major road instead of the two phases required at the conventional intersections. The time saved from having only one phase can then be redistributed to extend the green time for all approaches, thus moving more traffic through the intersection on each cycle without having to increase the overall cycle length. A study of four DLT intersections in other states showed a 10-30% increase in throughput and a 30-80% reduction in delays. A DLT in Baton Rouge reported a 40% decrease in travel time and average delay of less than half of that before the DLT. A survey of drivers who regularly use the DLT in Baton Rouge showed that 87% felt that traffic congestion was improved with 48% reporting their travel time "extremely decreased." Computer modeling of the Bandera/1604 intersection showed as much as a 75% reduction in delay with a DLT. Safety has also generally improved at DLT intersections studied with serious crashes decreasing 34% at the Baton Rouge location (total collisions were down 25%) and crashes at or near a DLT in Utah were reported to have decreased a whopping 60%. For a more extensive description of how a DLT works, see the Bandera and Loop 1604 DLT project page. 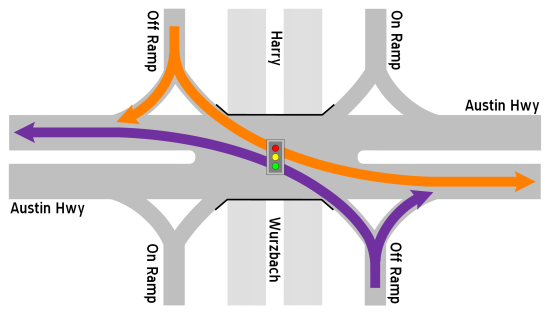 A DDI increases the throughput of an intersection by shifting all traffic on the major street to the left side of the road through the interchange. Doing so then allows two movements that would normally be conflicting to go at the same time. For example, the traffic from an access road can proceed at the same time that traffic coming on the cross street to its left is also moving. This overlapping eliminates one of the two signal phases required for them in a conventional intersection, making the signals much more efficient by allowing more traffic to move through the intersection in the same amount of time. A study of the DDI built in Round Rock in 2016 showed that despite a 50% increase in afternoon peak period traffic volumes after the DDI was completed, travel times improved 44-58% over the previous conventional intersections. DDIs also improve safety by reducing the number of potential crash points from 26 to 14 with the worst type (side-angle collisions) reduced from 10 to just two. Additionally, a DDI physically prevents drivers from turning the wrong way onto the access roads, thus helping to prevent head-on collisions on the freeway. A study of safety improvements at DDI intersections in Colorado showed a 36% reduction in crashes. A 60% reduction was reported at a DDI in Springfield, Missouri, where 97% of drivers reported they felt the DDI was safer than the previous conventional intersections. One of the drawbacks is that a DDI does not allow straight-through traffic on the access roads/ramps. If this is needed, it can be facilitated with a bypass roadway either above or below the intersection. 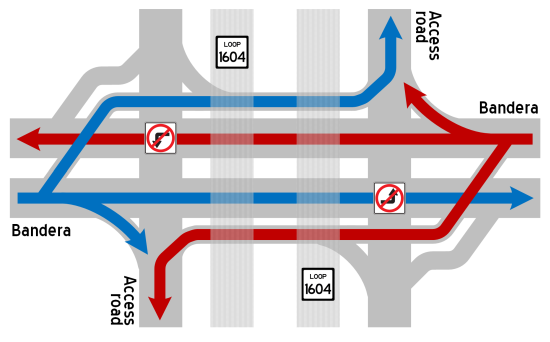 For a more extensive description of how a DDI works, see the Blanco and Loop 1604 DDI project page. A SPUI elongates a standard access road intersection so that the two intersections typically formed by the access roads on each side of the freeway are instead compressed into a single intersection located in the middle of the overpass/underpass. To do this,the access road approaches are bent inward so that the left turn movements can pass-by each other like they would at a typical surface street intersection. This allows the opposing left turn movements on each axis of the intersection to proceed simultaneously like they do in a typical surface street intersection, thus reducing the number of signal phases required from four to three. Right-turns still take place at the same location as they do in a conventional intersection. However, with a SPUI, there is no straight-through traffic on the access roads. If this is needed, it can be facilitated with a bypass roadway either above or below the intersection. For a more extensive description of how a SPUI works, see the Austin Highway and Harry Wurzbach SPUI project page. In both cases, the left turns from the cross street are instead shifted to the U-turn crossovers, thereby eliminating that phase from the signal cycle. In the Michigan Left, the left turns from the major street are also moved to the U-turns, so that phase is also eliminated, resulting in a simple two-phase signal at the main intersection. In a superstreet, because the through traffic on the cross street is also eliminated, it makes each half of the main intersection two smaller independent intersections instead, each with their own two-phase signal. These simplified signals are then able to function more efficiently. For more details on how a superstreet works and its local history, see the Superstreets page. There are no Michigan Left intersections in San Antonio although one was evaluated for the NW Military/Wurzbach intersection. CityLab - Could These Crazy Intersections Make Us Safer?